I recently started sailing with some folks in a Wednesday night racing league at the Armdale Yacht Club. This is a great time and it's my first experience racing. Up until this point all of my sailing has been very casual. The boat is a 31' Beneteau named Osprey and it sails great. Last week was the first week. There was plenty of wind and it was a great race, although we didn't place particularly well. This week, however, there was almost zero wind. There was debate around whether we should just pull out of the race and head into open water in search of wind. We decided to stick it out and finish the race. Previously I would never have gone out in wind like that. It was glass calm and much better conditions for water skiing. Why would anyone want to sail in this?? I'm glad that we did. It turns out to be a much more precise race when there isn't much wind. This was a revelation for me. It wasn't exactly exhilarating racing but it was interesting none the less. I'm no aficionado of gardening shears. This is the first set that I've used since using my parents 15 years ago. I must say however that the Fiskars Power-Lever Grass/Hedge Shears are a pretty nice set. I had originally thought that I might get a gas powered weed-eater type of setup. However, while browsing the isle at Canadian Tire I came across these beauties. I decided to do the eco-choice and give them a try. They are pretty pricey for a manual tool(I think I paid $45) but they are cheaper than a weed-eater. I have been absolutely impressed with them. They have telescoping handles and adjustments that make it very comfortable to use. I thought that it would take me longer than using a weed-eater but I have been impressed at how efficiently I can get the job done. The best part...I can trim the grass in shorts and sandals. Try that with a weed-eater! I am quickly becoming a fan of Fiskars. I bought a reel mower last year as an alternative to my gas munching power mower. I really hate using a gas mower. They are loud, smell terrible, are wicked on the environment and completely NOT relaxing. I did a fair amount of research but in the end I went for a cheap model, against most review recommendations. My thought was that I would use it as a proof of concept before spending more money on a deluxe model. The one I ended up choosing was the Yardworks Reel Mower 18" from Canadian Tire. Mow often. The more the merrier. If you wait until your grass is too long it will not cut it properly. 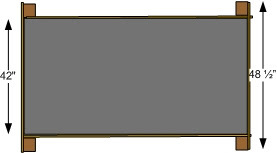 Allow yourself a half width overlap. That will give you a more consistent cut. Keep the blades adjusted properly. This is easy to do and saves a lot of annoyance in the long run. Get rid of your dandelions. Try the Fiskar tool! Those little yellow buggers will drive you nuts if you don't get rid of them. This mower will not trim them. I find that I enjoy cutting the grass now. It is quiet enough that I can use it first thing in the morning without worrying about bothering the neighbors. I do still use my power mower for the first cut of the year when things are straggly and also when I get negligent and let my grass get too long. I still haven't tried one of the deluxe models but I assume they work better. If they do, spend the extra cash. I really don't mind weeds ...generally. I have lived peacefully with dandelions for years with no problems. I would not normally have been a person to go out and spend $35 on a week puller. That being said, last year I bought a Yardworks 18-in Reel Mower as an environmentally friendly alternative to my smoke spewing gas mower. I've been mostly pleased with it and it does a good job on most grassy plants. It does not, however, handle dandelions well at all. Usually they simply slip underneath and survive unscathed, only to rear their heads tall and proud once I've passed. This does annoy me! So, I bought the Fiskar Weed Remover tool as a last resort (before resorting to my gas eating power mower). I have been VERY happy with the tool. This thing actually makes pulling dandelions fun. Really! You can actually pull and launch the weeds several feet in one smooth motion. It has a similar action, and pleasing feeling, to loading a shotgun. My only comment, they call this thing a "weed remover" but it isn't really that great at any weeds other than dandelions. That's ok for me though. They should just rename it "Dandelion Destructor" or "Dandelion Tormentor". This weekend our scout troup did a "little" project. Ok, it actually took around 6 hours to build. This platform is over 20' high! It is a copy of one that was built by the same troup over 30 years ago. I've completed the bed finally and my daughter couldn't be happier with it. I uploaded some pictures of some of the details in case that helps someone fill in the gaps of my plans. To make this place easier to find (and point people to) I have set up a new domain afloat.ca. 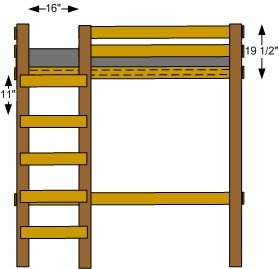 Here is the loft bed plan that I've come up with. Please feel free to use this as you like. If you re-publish these plans please reference my blog URL. I hope someone finds these helpful. Email me or post a comment if there is something that is unclear. I'll posts some pictures of the different parts of the bed too. Hopefully that will clarify. 4 side boards - 75"
2 side boards - 55"
12 screws - 1 1/4"
60 stove bolts - 4"
Counter sink stove bolts and cover holes with knobs so that bolts aren't sticking out. I used a 3/4" bit to countersink. 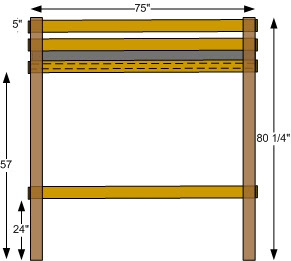 The bottom supports can be out of any size wood and the plywood could be skipped if you add more bottom support rungs. We decided that our daughter needed a loft bed. She has a relatively small bedroom and a loft bed would give her an area under her bed for playing and storing things. 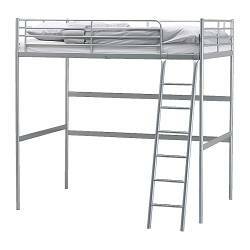 I looked at a lot of loft beds that are on the market and really didn't see anything I liked. They were either overpriced (for the value) or they were flimsy. For example, Ikea has a couple that I looked at (see left) but I just didn't like the construction or quality. I decided that I would build one instead. I figured that I could build on that was cheaper and that would last. I think I was successful on both accounts. There are some plans online for purchase but I decided to design my own. In retrospect I probably should have just bought a set because it was a bit of a pain getting some of the details worked out but I'm happy with the end result. The bed looks great and could hold a herd of elephants. The basic design uses 4x4 spruce posts and 1x4 pine board for most of the horizontals. Over the next few posts I will detail the design and construction.